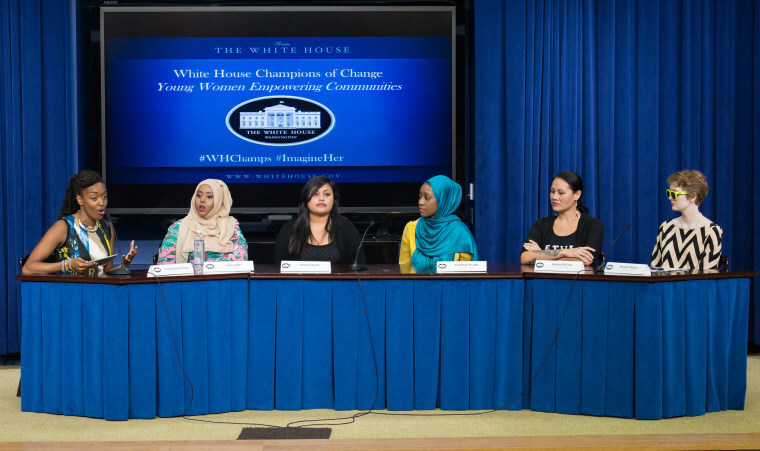 The White House Honors Women "Champions of Change"
The White House honored 11 ambitious young women Tuesday who are impacting their communities with their courageous leadership. These “Champions of Change” are all multicultural women and are managers in various industries such as technology, health care, education and agriculture. The most senior women in the Obama administration, Valerie Jarrett, Tina Tchen, Alejandra Ceja spoke and commended the honorees for taking on huge responsibilities at such young ages and said their investments in their communities are also investments to the country, as a whole. Asha Abdi, Marissa Jennings andFaatimah Knight were the three African-American women who were recognized. Since 2010, Abdi has served the Somali and Muslim community by creating programs that enhance the lives of first generation Somali Americans. During a panel at the ceremony, moderated by Franchesca Ramsey, host of MTV News’ Decoded, Abdi said she’s inspired by women who’ve done amazing things and she adopts the characteristics of those women. Knight raised funds for black churches across the South that were burned down due to arson. Through a campaign called #RebuildwithLove, she gained enormous attention and in less than three weeks, raised over $100,000 for four black churches with the help from Muslim charities. Jennings is the founder of SOCIALgrlz LLC, the first mobile web publishing company creating content exclusively for African-American girls ages 13-17. Her tech start-up acts as a voice for African-American girls through modern technology. And currently, she’s developing an app with Microsoft that’s being tested by the all-girls school St. Mary's Academy in New Orleans. Diali Avila - Avila focuses on community education around the Affordable Care Act and also helps individuals and families enroll in health insurance. Yesenia Ayala -She mentors middle and high school Latino students, facilitates family programming and events, and engages her peers in helping motivate Latino students to stay in school and plan for college. Meredith Boyce - She became the first official accessible technology consultant, rehabbing old laptops and setting up adaptive technology solutions for fellow blind students. Rita Herford - Uses sustainable farming techniques to grow a total of 4,400 acres of wheat, sugar beets, dry edible beans, corn, and soybeans. Rita helps educate consumers about how modern day farmers grow safe, quality and inexpensive food. Ashley McCray - Works to ensure the University of Oklahoma incorporates inclusivity and diversity in its curriculum. Her work has led to a mandatory diversity course for incoming students, and a series of diversity workshops throughout the school year for faculty, students, and staff. Swetha Prabakaran - Founder and CEO of Everybody Code Now!, a non-profit organization that empowers youth to become engineers, scientists, and entrepreneurs. Katie Prior - Founder of the Youth Trumpet & Taps Corps, an organization that trains and supports high school trumpet players who use their musical talents to honor military veterans. Amanda Tachine - Amanda mentored underrepresented, mostly Native American college and high school students through the program Native SOAR (Student Outreach, Access, and Resiliency).